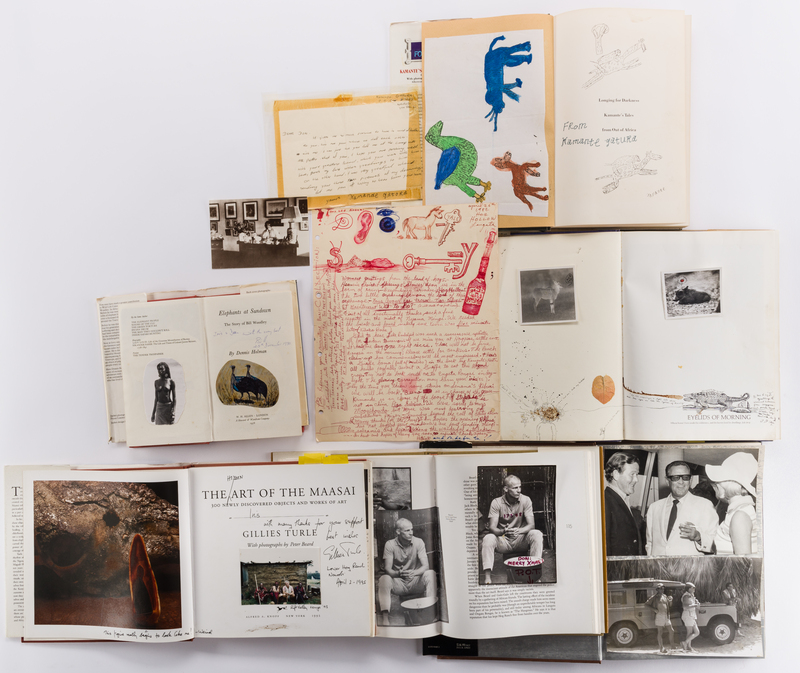 Seven (7) Africa related archival items of Don Hunt, one of the founding members of the Mount Kenya Wildlife Conservancy, including books with photographs, personal notations and correspondence from the photographer and artist Peter Beard. This lot includes 6 books with personal notations, drawings and photos plus one handwritten letter and two handwritten Christmas cards. 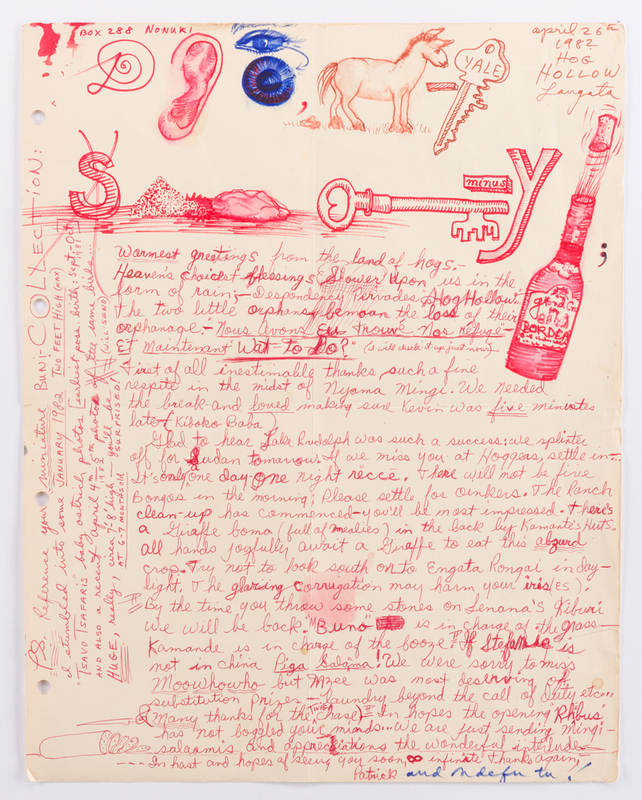 1st item: Handwritten letter in red marker on cream art paper, from Peter Beard to Iris and Don Hunt, dated "April 26th 1982 Hog Hollow Langata" and addressed to Iris and Don using pictograms, highlights include: "Warmest greetings from the land of hogs- Heaven's choicest blessings Shower upon us in the form of rain; …Glad to hear Lake Rudolph was such a success, we splinter off for Sudan tomorrow. If we miss you at Hoggers, settle in-.. By the time you throw some stones on Lenana's Kiburi we will be back. 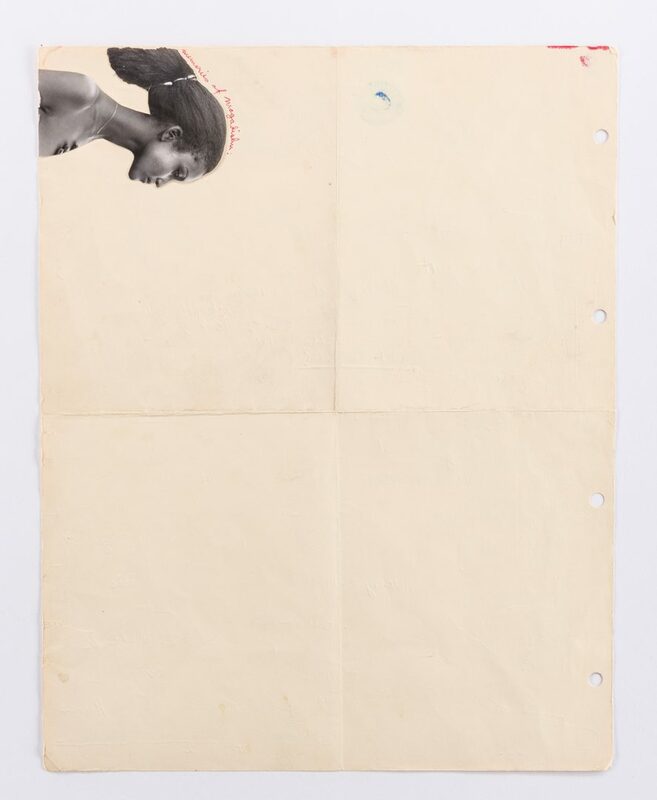 "M. Buno" is in charge of the grass–Kamande is in charge of the booze…In hopes the opening "Rhebus" has not boggled your minds…" Signed "Patrick" with black and white cut out photo of young female pasted on reverse and titled "memories of Mogadishu". 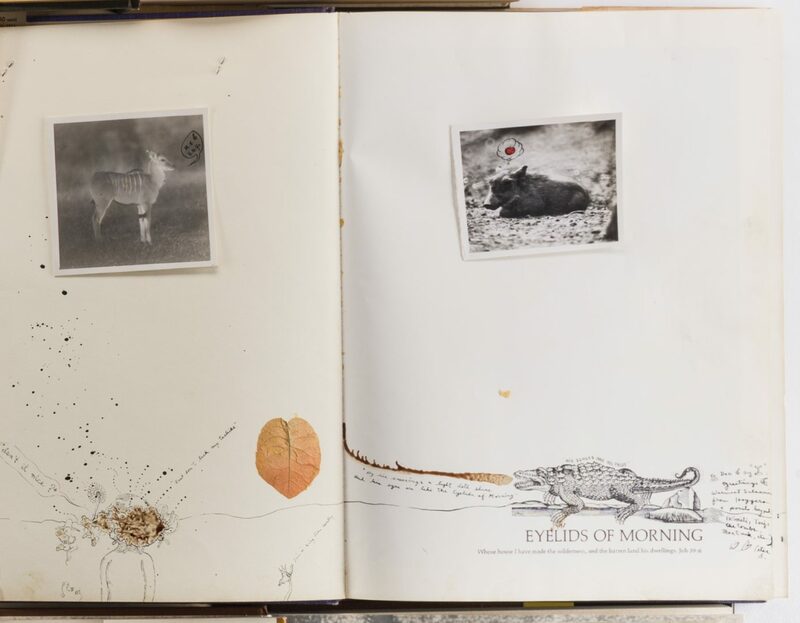 14" H x 11" W. 2nd item: EYELIDS OF MORNING, the Mingled Destinies of Crocodiles and Men, The Origins, History and Prospects of Lake Rudolph… by Alistair Graham and Peter Beard, second printing, 1973, endpaper with attached 1975 Peter Beard hand-inscribed Christmas card, half-title page with two black and white Peter Beard hand-inscribed note cards, one with dried insect, plus additional inscriptions, drawing, dried leaf and bodily fluid. Plus B&W photo of same elderly male subject as depicted on page 84, reading EYELIDS OF MORNING, taped on pg. 83, pencil numbered "76" en verso. 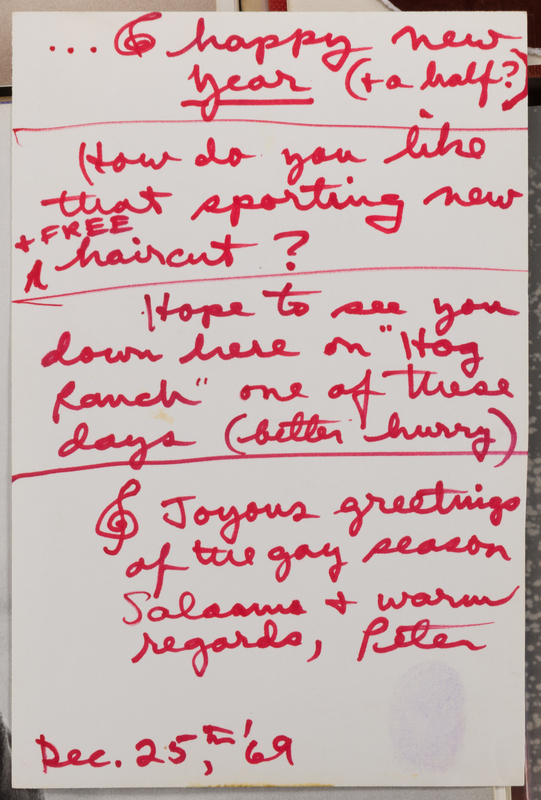 3rd item: THE ADVENTURES AND MISADVENTURES OF PETER BEARD IN AFRICA, by Jon Bowermaster, 1993, First Edition, including a B&W photo of Peter Beard while in prison in 1969 from attacking a poacher on his property with a handwritten Christmas greeting, comments, Dec. 25, '69 and Peter Beard signature en verso. A second B&W photo of an unknown person with a warthog is glued on the endpaper. 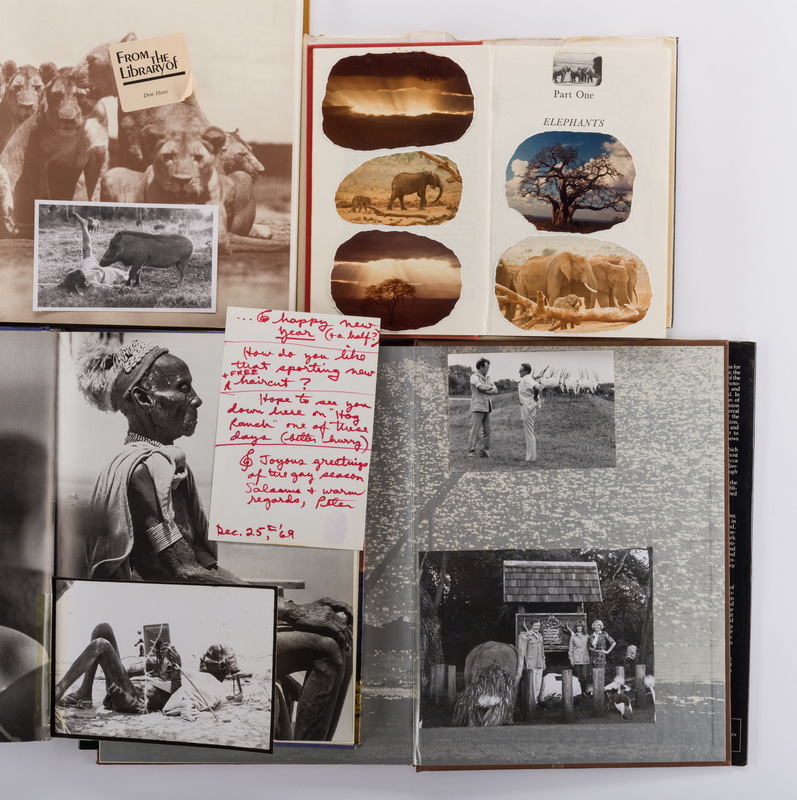 4th item: LONGING FOR DARKNESS, KAMANTE'S TALES FROM OUT OF AFRICA, COLLECTED BY PETER BEARD, copyright 1975 by Peter Hill Beard, First Edition. 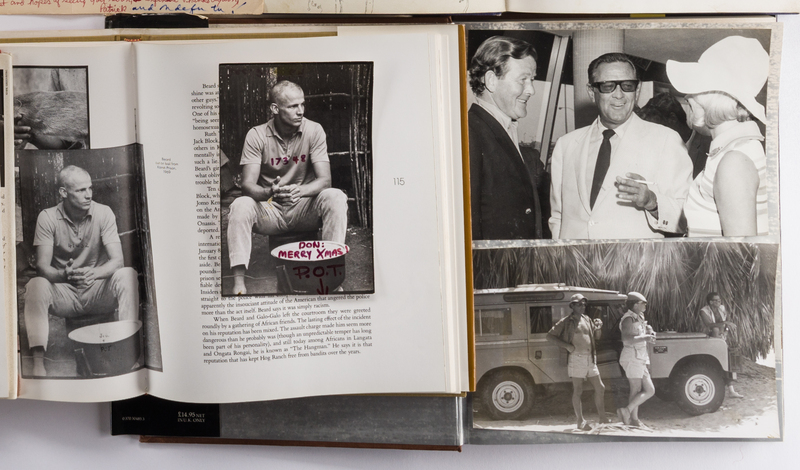 Book is personalized with B&W photo, torn around perimeter, of Peter Beard huddled around numerous photos and manuscripts, hand-written note from Kamante to Don Hunt and two watercolors on paper by Kamante of animals attached to the endpapers. 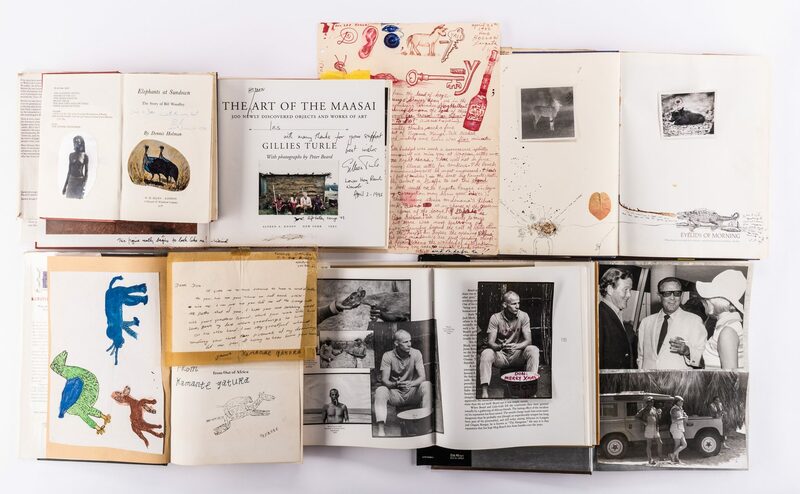 5th item: THE ART OF THE MAASAI by Gilles Turle, photos by Peter Beard, 1992, First Edition. 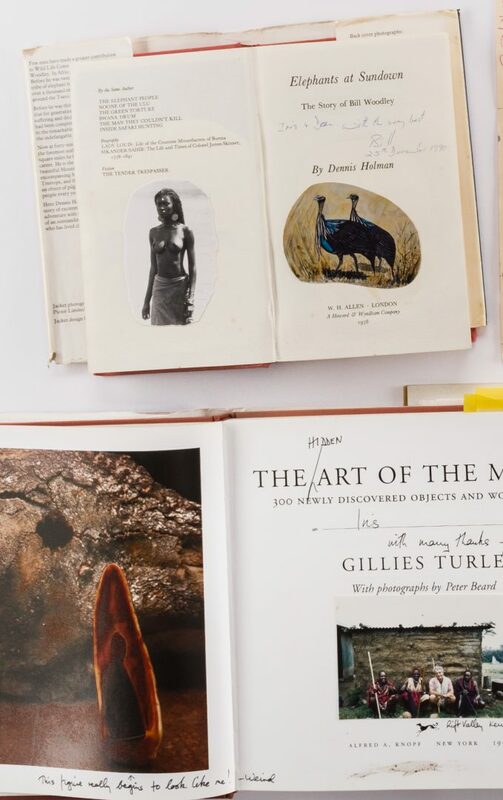 Title page with personal note to Iris Hunt by author, photo of author with three Maasai with mud and pencil image of fish, likely by Peter Beard, below. 6th item: ELEPHANTS AT SUNDOWN, The Story of Bill Woodley by Dennis Holman, 1978, containing approx. 37 additional personal photos, including of model Fayal Tall, friends, family, landscape and wildlife, mostly torn around edges and glued onto pages. 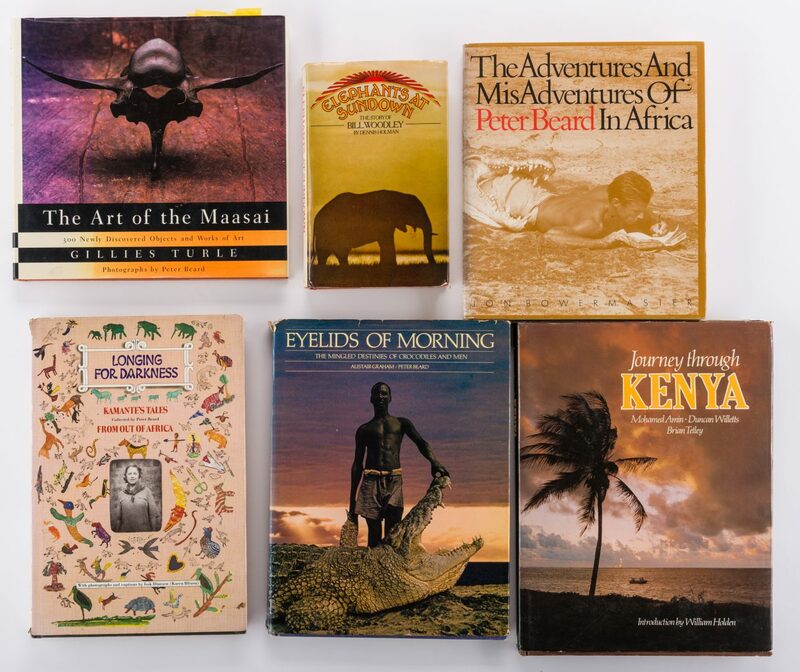 7th item: JOURNEY THROUGH KENYA by Amin, Willetts and Tetley with intro. by William Holden, 1982, containing approximately 12 additional personal photos of William Holden, Stephanie Powers, friends and wildlife. 8-3/4" H x 5-1/2" W x 1-1/8" D to 13" H x 10" W x 3/4" D. Note: Don Hunt's bookplate is pasted on the inside cover of each book in this listing. Provenance: South Carolina collector. CONDITION: 1st item: Center crease, 1" L tear, creases at corners. 1" x 1-1/4" watermark. 2nd-7th items: Overall very good condition with minor wear to dust jackets.